Viscometers from Lamy Rheology Instruments are unlike any other. Each model can be configured to almost any specification with the right spindles, temperature control and software. The Lamy Viscometers and Rheometers do not use springs or torsion rods that require frequent recalibration. They incorporate an integrated calculator for processing viscosity test results. All Lamy instruments feature a 7” touchscreen and come with a stylus. This easy-to-use screen lets you see all measurement parameters at the same time. All Lamy Viscometers and Rheometers can connect to a computer via USB port for data transfer. All except the B-One Plus also offer an RS232 port, as well as printer connection capability via USB Host Port or Compatible PCL/5. What makes these viscometers unique? Operates effectively without a spring, so all measurement ranges (low, regular and high viscosity) can be tested with one instrument. Provides instant readings because the instrument doesn't need to take extra time to stabilize. Easier spindle attachment with bayonet fittings. The B-One Plus Viscometer offers a viscosity measurement range of 33 to 240,000,000 mPa·s depending on what spindles are used (LR version 1 - 22,000,000 mPa·s.). This basic instrument allows you to conduct one-step viscosity tests on your samples. 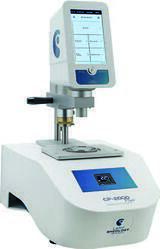 Wide speed and torque range - one instrument for most levels of viscosity. Set measuring times for thixotropic products. Option to add temperature probe for monitoring product temperature during testing. For your ultra-sensitive measurements, the First Plus Viscometer features a torque range of 0.05 to 13 mNm (or 0.005 to 0.8 mNm for LR). The spring-less design makes the First Plus a robust instrument for measuring dynamic viscosities. The instrument can be controlled externally with the optional Rheotex software. A digital readout of the viscosity test conditions and results. The capability to send results to a printer or computer. A PT 100 temperature sensor (which indicates temperatures between -50 °C to +300 °C) to monitor the temperature of the sample. A step between the First Plus Viscometer and the RM 100 Plus Viscometer, the new First Pro Viscometer offers an economical option that compares to the Brookfield DV2. Same speed range and spindle compatibility as the First Plus Viscometer. Program and save one-step tests like the RM 100 Plus Viscometer. Optional Rheotex software allows for external control and programming multi-step tests. With the RM 100 Plus Viscometer, you can program your measurement methods directly using the touch screen, and save your data for export and analysis. It has a viscosity range of 1 - 780,000,000 mPa·s (depending on the spindles used). The RM 100 Plus has an integrated temperature probe that may be used to monitor temperature with or without the temperature control system. May be used to satisfy many ASTM, DIN, BS, EN, IOCCC, and ISO standards (see RM 100 Plus page for more information). UD display available with use of MS-R spindles. Able to connect to and directly control temperature control systems. Save one-step testing parameters on the instrument for future use. Test results may also be saved on the instrument. The RM 200 Plus can generate and fit flow curves without using a computer. It also has ports to connect to a computer or printer. It has a torque range of 0.05-30 mNm. 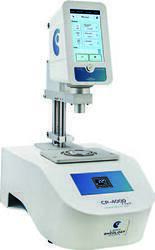 The RM 200 Plus is a special rotating rheometer useful for research and development, as well as in a quality control production environment. Free selection of speed from 0.3-1500 rpm. Can fit flow curves for Plastic viscosity, flow limit, Thixotropy, Regression model according to Newton, Bingham, Casson, and Ostwald. Can have computer control of the entire test process with optional Rheotex software. The DSR 500 Plus Rheometer provides same rheological features of the RM 200 Plus, and also gives you the option to direct curves and control shear stress directly on the instrument. Connect to and directly control temperature control systems. Fit flow curves for Plastic viscosity, flow limit, Thixotropy, Regression model according to Newton, Bingham, Casson, and Ostwald. Able to have computer control of the entire test process with optional Rheotex software. The GT-300 Plus Gel Timer Viscometer allows you to test the curing time (or gel time) of products such as epoxies, adhesives, sealants, paints, and polymers. It's easy to test materials that can turn rock solid as they cure, because every bit of the instrument that could come into direct contact with the sample is disposable - the spindle, the sample cup, and even the temperature probe! Temperature control options include no temperature control, room temp - 300°C, 15°C - 60°C, or 0°C - 150°C. Temperature probe comes in 5m lengths that can be cut away and disposed of after each test. Includes Rheotex software, which allows you to see the graph results on your computer screen, control testing through your PC, and save data directly on the computer. Cone-plate measurements are ideal for limited sample quantities, and products that are difficult to clean. All CP models offer a huge measuring range, programming and recording test parameters, an integrated temperature probe, and compatibility with Rheotex software. 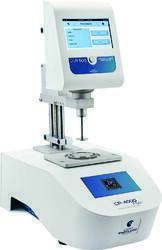 The RM 100 CP 2000 Plus Viscometer is just like the RM 100 Plus in terms of its measuring range and programming capabilities, but only uses MS CP spindles. An integrated temperature control accessory allows you to keep the temperature of your sample consistent during testing. Temperature control options range from -20°C - 300°C, depending on the model. Optional Rheotex software allows you to control testing via computer. The RM 200 CP 4000 Plus Rheometer offers the rheological capabilities of the RM 200 Plus Viscometer while modified for ideal cone-plate testing. It offers automatic lifting of the instrument so you can set a precise gap for each measurement. Fit flow curves directly on the instrument. Temperature control options ranging from -20°C - 300°C, depending on the model. Optional Rheotex software to control testing via computer. The DSR 500 CP 4000 Plus Rheometer offers the same features as the RM 200 CP 4000 Plus, with additional ability to direct curves, and control shear stress directly on the instrument.